The Sabaragamuwa Province, (Sinhalese : සබරගමුව පළාතSabaragamuwa Palata, Tamil : சபரகமுவ மாகாணம்Sabaragamuwa Maakaanam) is one of the nine provinces of Sri Lanka, the first level administrative division of the country. The provinces have existed since the 19th century but did not have any legal status until 1987 when the 13th Amendment to the Constitution of Sri Lanka established provincial councils. The Sabaragamuwa Province contains two districts: Ratnapura and Kegalle. It is named after its former indigenous inhabitants, namely the Sabara, an indic term for hunter-gatherer tribes, a term seldom used in ancient Sri Lanka. Sabaragamuwa University is in Belihuloya. Sinhalese, known natively as Sinhala, is the native language of the Sinhalese people, who make up the largest ethnic group in Sri Lanka, numbering about 16 million. Sinhalese is also spoken as a second language by other ethnic groups in Sri Lanka, totalling about four million. It belongs to the Indo-Aryan branch of the Indo-European languages. Sinhalese is written using the Sinhalese script, which is one of the Brahmic scripts, a descendant of the ancient Indian Brahmi script closely related to the Kadamba alphabet. 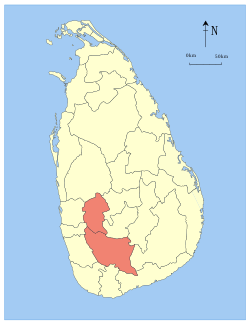 In Sri Lanka, provinces are the first level administrative division. They were first established by the British rulers of Ceylon in 1833. Over the next century most of the administrative functions were transferred to the districts, the second level administrative division. By the middle of the 20th century the provinces had become merely ceremonial. This changed in 1987 when, following several decades of increasing demand for a decentralization, the 13th Amendment to the 1978 Constitution of Sri Lanka established provincial councils. Currently there are nine provinces. Kegalle is a district in Sabaragamuwa Province, Sri Lanka. It is one of 25 districts of Sri Lanka, the second level administrative division of the country. The district is administered by a District Secretariat headed by a District Secretary appointed by the central government of Sri Lanka. It was a former Dissavani of Sri Lanka. Belihuloya is a village in the Ratnapura District, Sabaragamuwa Province of Sri Lanka. It is approximately 150 kilometres (93 mi) south-east of Colombo and is situated at an elevation of 616 metres (2,021 ft) above sea level. This hillside location is a climatically transitional area, linking both the dry and wet zones and the hill and low country. Belihuloya, is derived from the Belih Oya, which flows through the area. There are two villages in Sri Lanka named Kalawana. One is in Gampaha district. It is situated approximately 12 km away from the City of Gampaha, 17 km from the City of Negombo and also in close proximity to suburban areas of Minuwangoda. Paddy and betel cultivation had been the main source of income for many families for decades. Kuruwita is a town in the Ratnapura District of Sabaragamuwa Province of Sri Lanka. It is 87 km from Colombo. It used to be served by the 2 ft 6 in narrow gauge Sabaragamuwa Railway, a branch of the national railway system. And known for the nearby waterfall called Bopath Ella. The Southern Province of Sri Lanka is one of the nine provinces of Sri Lanka, the first level administrative division of the country. The provinces have existed since the 19th century but did not have any legal status until 1987 when the 13th Amendment to the Constitution of Sri Lanka established provincial councils. It is the 7th largest province by area and is home to 2.5 million people, the 3rd most populated province. The province is bordered by Sabaragamuwa Province and Uva Province to the North, Eastern Province to the Northeast, Western Province to the Northwest and the Indian Ocean to the South, West and East. The Province's capital is Galle. The Sabaragamuwa University of Sri Lanka is a public university in Belihuloya, Balangoda, Sri Lanka. It was founded on 20 November 1991 and consists of six faculties. Embilipitiya is a town, governed by an urban council, in Ratnapura District, Sabaragamuwa Province, Sri Lanka. The Roman Catholic Diocese of Galle is a diocese of the Latin Rite of the Roman Catholic Church in Sri Lanka. Sri Lanka has held several rounds of Provincial Council elections in 2008 and 2009 to elect members to eight of the country’s Provincial Councils. The decision to hold elections in different parts of the country on separate days was a break in the usual practice, which is to hold elections for the whole country on the same day. For each provincial council, members are elected to serve a five-year term. A chief minister for the province is chosen by the elected members. Athauda Seneviratne is a Sri Lankan politician and a former member of the Parliament of Sri Lanka.He is also a former Cabinet Minister of Sri Lanka. Kegalle electoral district is one of the 22 multi-member electoral districts of Sri Lanka created by the 1978 Constitution of Sri Lanka. The district is conterminous with the administrative district of Kegalle in the Sabaragamuwa province. The district currently elects 9 of the 225 members of the Sri Lankan Parliament and had 613,938 registered electors in 2010. Ratnapura electoral district is one of the 22 multi-member electoral districts of Sri Lanka created by the 1978 Constitution of Sri Lanka. The district is conterminous with the administrative district of Ratnapura in the Sabaragamuwa province. The district currently elects 10 of the 225 members of the Sri Lankan Parliament and had 734,651 registered electors in 2010. The 2004 Sri Lankan provincial council election was held on 24 April 2004 and 10 July 2004 to elect members to seven provincial councils in Sri Lanka. No election was held in the eighth province, North Eastern, which had been governed directly by the national government since March 1990. The United People's Freedom Alliance, which was in power nationally, won all seven provinces. Provincial council elections were held in Sri Lanka on 8 September 2012 to elect 114 members to three of the nine provincial councils in the country. 3.3 million Sri Lankans were eligible to vote in the election. Elections for the Northern Provincial Council, which had been governed directly by the national government since it was demerged from the North Eastern Provincial Council in January 2007, are overdue but the government has not set a date. Elections to the remaining five provincial councils are not due till 2014 as they had their last election in 2009. Provincial council elections were held in Sri Lanka on 21 September 2013 to elect 148 members to three of the nine provincial councils in the country. 4.4 million Sri Lankans were eligible to vote in the election. Elections to the remaining six provincial councils were not due as they had their last election in 2009 or 2012. This was the first provincial council election in the Northern Province in 25 years. Provincial governments of Sri Lanka are the devolved governments of the nine Provinces of Sri Lanka. In accordance with the Sri Lankan constitution, provinces have legislative power over a variety of matters including agriculture, education, health, housing, local government, planning, road transport and social services. The constitution also gives them powers over police and land but successive central governments have refused to devolve these powers to the provinces. ↑ :.News Line : North, East record highest GDP growth rate Archived 2012-06-20 at the Wayback Machine. ↑ "Provinces of Sri Lanka". Statoids. ↑ "Provincial Councils". Government of Sri Lanka. Archived from the original on 2009-07-07.